I can't remember if I did an update from the Aug. 11 post or not, so bear with me if I repeat stuff. All good things come to an end. We said goodbye to more stuff, including our mattress. Hi all. Life has taken quite a turn. What we thought was dementia turned out to be GBM (glioblastoma) tumors I. His brain. If you can choose what type of a tumor to have, this is NOT it. He has surgery on Thursday. They could get 70% of the front lobal tumor, the other was inoperable. He will get chemo and radiation which will give us more, and better time, for several months. Vintage Stitchers had a party to say goodbye to me. Hi all -- it's been way too long since I last posted here. It's so nice to see so many 'faces' I know as I scan the posts. Honestly, I can't remember when I last posted, so some of this may be old stuff but other will be new. 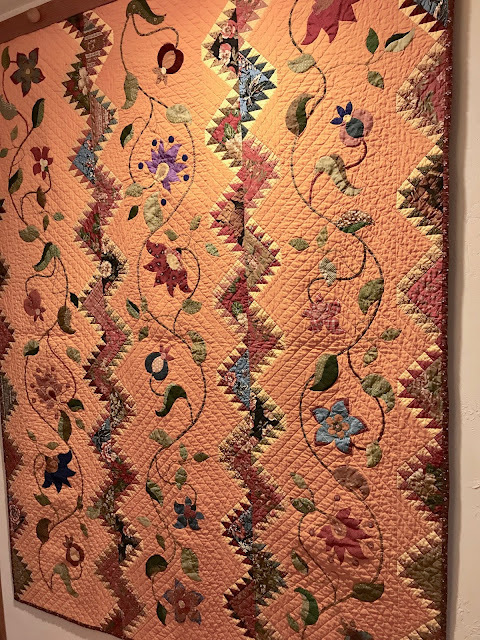 I have managed to do some quilting/fiber art over the last several months, but my time is mostly filled with other things of life these days. We've moved on from buttonholes and buttons to decorative stitching with my new Eversewn Sparrow 15. Here's a look at the latest.